A personalised water bottle featuring Baa Baa the Little Sheep from the Little Folk Alphabet range. 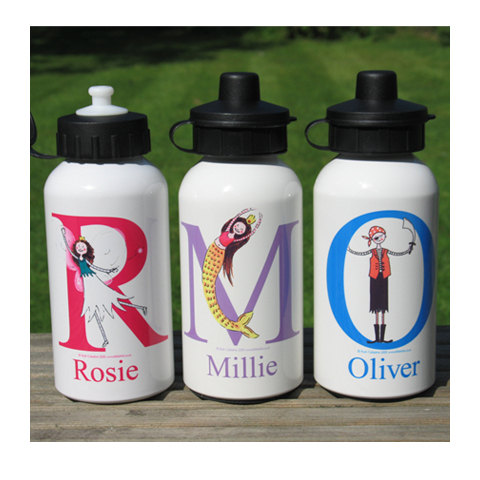 You can personalise this hand-printed drinks bottle with your child's name and also choose their favourite colour for the lettering. We all know it's really important that our children drink plenty of water, whether they are at home, at school, at a club or on holiday. These attractive white sports bottles are the perfect way to encourage your child to drink frequently throughout the day. They are also a great way of encouraging your child to become environmentally friendly by reducing the number of plastic bottles that are thrown away. The named bottles are made out of high quality aluminium and have a pull out spout inside the drinking cap. They are also supplied with a stopper and a clip. The clip fastens easily to belts or bags. Replacement spouts and lid sets are also available from Little Folk. Bottle size 400ml. Height 138mm. Diameter 65mm. In order to prolong the life of the personalised image on your drinks bottle we recommend only washing by hand. Not suitable for dishwasher, freezing, microwave or cleaning with strong detergents or abrasives.